So the clouds and the dark are here in abundance now. As Christmas rolls in on Atlantic winds, my ability to get panels in front of sunlight is diminishing. The odd nice day here and there provides maybe a couple of hours of weak light, which isn't quite enough. The risk of my phone failing when I'm somewhere random is pretty high, and the situation isn't helped by a recent Android upgrade. So I'm going to call it for the year. I think I have just enough battery left to last till tomorrow, which symbolically is the winter Solstice and the shortest day. I like the synchronicity there, and so plan to use my phone as little as possible today, and end the solar cycle after 7 and a half months. Which ain't bad. I'll use the next couple of months to take stock - maybe a review of the year, what I've learned, and what I want to do differently next year. With a bit of luck, the light will be ok again from February onwards, so I'd love to get my plan sorted out before then, ready to go. Maybe permanently in-place panels, more batteries, etc. That kind of stuff. Also, MOAR READING about electricity generally, probably. So if you've been reading these posts, thanks for that. It's been a long time since the start of May, and hopefully this blog proves that it can be done. I knew clouds would make things interesting (see last post). An abundance of sunshine allows for laziness - it's the deep darkness of winter where necessity becomes invention. 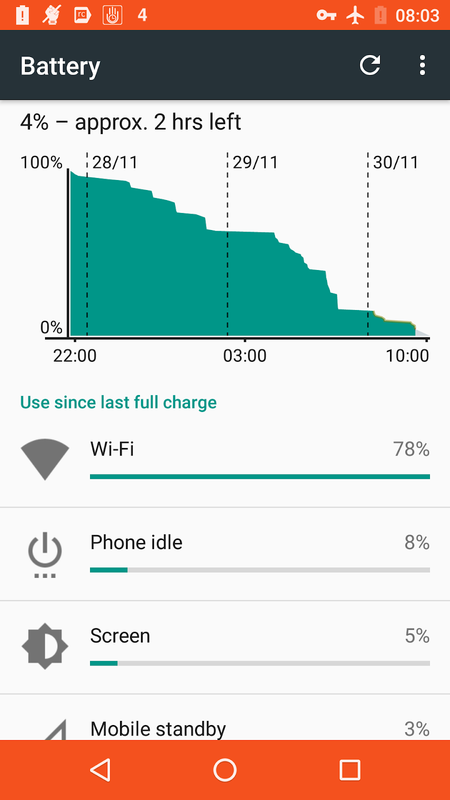 Currently battery levels are low - I have maybe 2 or 3 charges left, which is 2-3 days on normal summer use. It's Tuesday today, and the next predicted sunshine is for Friday. That's a bit too close for comfort. So I can't skip to the Southern hemisphere quickly, or seed the air with magic cloud-dispersal beams. I can only change what's in my control - and that comes down to what my phone is doing. So here are some current suggestions. Some people can live with only a few apps. I'm curious about what's out there, to get interesting ideas. And I have kids, and yes, sometimes a phone is the easiest way for a bit of peace and quiet. So there's a fair amount of 'gumph' on my phone. Step one is to uninstall what you don't need. This has three aims: first, stop any unnecessary background tasks/data usage. Second, to avoid any extra load caused by installing updates (especially if you have them turned on automatically, via your usual app store). And third, to stop using your phone for distractions. Sorry kids! Here's a pack of cards instead. It seems annoyingly difficult to control how much apps check in to their home server - a lot of them let you turn off notifications but it's not clear whether they still request data or not. Assume that they do, because capitalist tech and it likes to know everything about you. 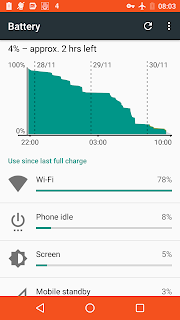 But that all takes energy too - I often see a battery drop of a few % straight after connecting to wifi for the first time in a while - I assume a bunch of apps are making the most of the renewed connection. NetGuard, available on F-Droid and Google Play - this runs as a VPN and gives you fine-grained control over which apps can connect under either WiFi or Mobile Data conditions. Net Monitor, also on F-Droid and Google Play - this lets you see which of your apps are making connections in the background, which can be useful when trying to work out which ones might be taking up more energy than others. Do a bit of detective work to see what's connecting, but ultimately, lock down network access for anything non-essential, and feel free to open it up later on, on a per-app, per-need basis. 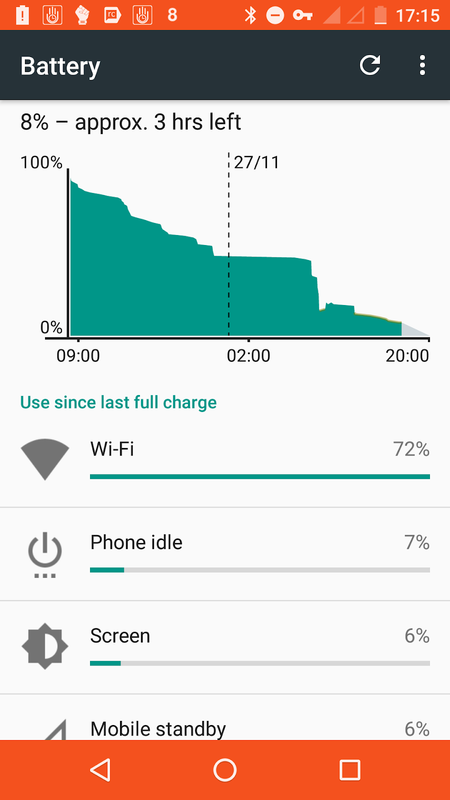 YourHour (Play Store) has been my favourite app so far - it's one of many that tracks device usage, and you can set it to only track certain apps, show you an ongoing timer for each, and set a daily limit (although it doesn't seem to lock me out after this limit). It's great getting to the end of the day, and realising you've only used for 10 minutes, without worry. I've also got a lot more reading done. Off The Grid, available on the Play Store - this locks your phone down for the time you set, allowing you whitelist one app for free, and allowing incoming calls. I whitelist my messaging app in case I need it. I'm not sure if I'll be paying 89p a month to whitelist further apps though, and will probably look for free alternatives. Still, it's a useful app to start with, and good for those bursts of time when you think you'll be tempted to fiddle with your phone. Peace of Mind+ (F-Droid, Play Store) originated from the Fairphone stable and is now available for free. It doesn't lock you out like Off The Grid, but does put you in the mindset of just not using your phone. There are a whole bunch of these kinds of app these days, which is probably a good thing. I don't have the battery to install too many ;-) so let me know if there are any in particular that you think are good. I started doing this when I was on holiday and started running out of juice. Back then, I was also manually disabling background data, but I suspect battery saver mode and using NetGuard basically covers it. 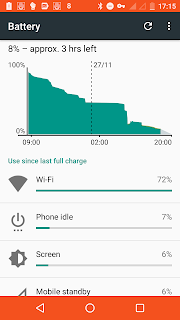 Over time, as I've got more sensitive to battery usage, I've noticed certain apps and behaviours really drain the battery, so I've started avoiding these. In general, I find the Camera app - with its live video view - fairly intensive. So back to good old analogue film there, whoop! In addition to all this, I've also started switching off Bluetooth when absolutely necessary (which means my watch no longer gets notifications - I do prefer the gentle buzz and otherwise silence, over udio prompts though, so will try to turn this back on soon). And I'm trying out locking the screen to Portrait Mode - I have no idea if this saves anything though. Getting about 2.5 days on a single charge, which makes a big difference in this weather. I figure I can harvest about 5000-6000mAh on a sunnyish day, which is only maybe 2 or 3 charges, so the difference between 2 days and 9 days is huge. The grey days and rainclouds are persisting as I near the 7-month milestone. Will I make it much further though? If you'd like to help support my ongoing solarpunk efforts, you can contribute via Patreon, or see other ways to donate a little. Thanks!